How to express the real experience of this fascinating, complex nation? South Korea is most decidedly a forward-thinking country with hurry-hurry approach to everything, a greedy appetite for technological advancement and a strong can-do attitude. Its fast forward approach all the way makes it so exciting and at times unnerving; it’s a country of endless possibilities. Vishvet foundation is inviting you to explore the country where real growth will be scene with discipline of Koreans. The fact that all Koreans speak and write the same language has been a crucial factor in their strong national identity. South Korea's academic environment is extremely competitive. Korean society regards getting into a prestigious university as a prerequisite to success. Serene temples, picturesque mountains, lush rice paddies, unspoiled fishing villages and endless hiking opportunities are so far off the beaten track always attracts you to visit South Korea. - Wide variety of international schools and Universities. - Better way to learn about customs and way of life by experiencing it firsthand. - Learn a bit of Korean language. - Best region will be provided to get worth of experience on your cost. - Most considerable experience at South Korea combines with Art, History, Debate, Street talk, folklore with fun and exciting activities. 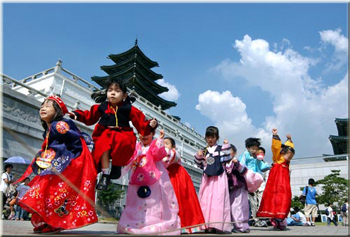 - Learn more about Korean higher education, society and culture.